Why do we need an embedded language for stream processing? I will use an example to demonstrate the kind of problems I ran into when writing code for stream processing applications, and show how Streamulus solves them. I'd be interested in alternative solutions; leave a comment or email me. 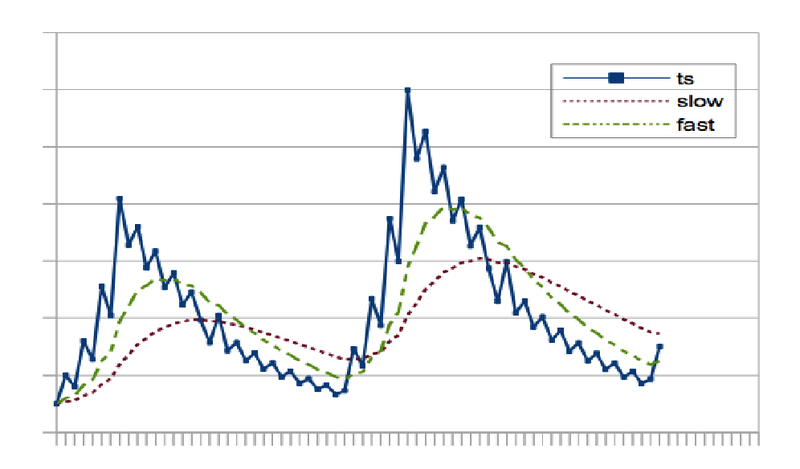 When the slow-decaying moving average crosses the fast-decaying one from below, this indicates that the time series recently changed direction from increasing to decreasing. In financial technical analysis this case is called a "death cross", while the opposite case is termed a "golden cross". All is well until, one day, another part of the program needs to use the values of the moving averages. You are asked to refactor the code to make that possible. With the refactored class, we are forcing the user to write code which is vulnerable for two related but different reasons. First, the dependence of cross_detection on slow and fast needs to be stated twice: Once when references to slow and fast are passed into the cross_detection constructor, and again in HandleInput, where they all must be updated together, in the correct order. The second problem is that the dependence of cross_detection on slow and fast in HandleInput is implicit. There is nothing in the code of this function to suggest that this dependence exists, which is why we added comments in the hope that whoever might try to modify this function will be aware of the invisible connections between its lines. However, comments are not a substitute for clear code. This function is fragile and can break in subtle ways - you might remove one of the moving average updates, or relocate it after the cross_detection.Update() call, creating a logical bug. Or, you might replace the last two lines with something that does not depend on slow and fast, but leave the first two lines that update them, creating a performance bug. The examples that come with Streamulus contain a complete program for the cross detection problem. The code is structured as follows. So far, this is not very different from the object oriented solution we described above - first we define the types that we will use, then we create instances of them and hook them up together. We merely insert the new value into the input stream ts, and the data structure that Streamulus created from our expression will propagate it through the expression and update whatever needs to be updated by invoking the operators whose inputs have changed. Importantly, only those operators will be invoked, while unaffected parts of the expression will not be recomputed. Now, if we decide to use a different moving average in the expression, HandleInput doesn't need to change.